V-Nasty – Not As Nasty As She Wants To Be? 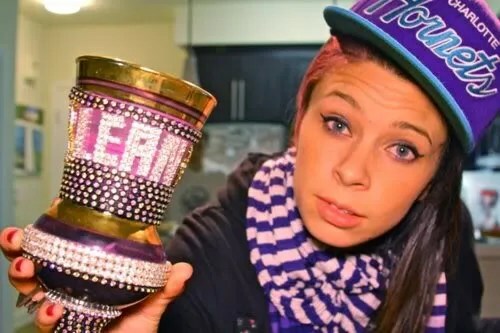 Some people only think of V-Nasty as the rapper from Kreayshawn’s White Girl Mob that drops the N-bomb. Those who’ve heard her music may think she’s an angry person. Those who’ve seen her live performances may think of her as the happy person they’ve seen on stage, smiling and high-fiving fans. None of those images, however, give the full story on who V-Nasty is, and that’s because, according to her, she’s struggling to tell that story herself. It’s that struggle that’s the aspect of V-Nasty that most never get a chance to see. This isn’t a typical “struggle to get out of the hood” type of struggle, although that’s certainly an aspect of it. Rather, it’s the struggle of knowing she doesn’t have the right words for what she wants to say, and desperately wanting those words to come to her. Despite her brash demeanor on the mic, there’s a vulnerability to V-Nasty that, if more people saw, might change some opinions of her. On the heels of the release of V-Nasty’s mixtape, Doin Number$, RapReviews sat down with controversial artist to discuss the initial impression people had of her, her goal of going back to school, and her unique relationship with her fans. The mother of two also opened up about the highly unlikely prospect of becoming a soccer mom. Read the full interview at RapReviews.com.